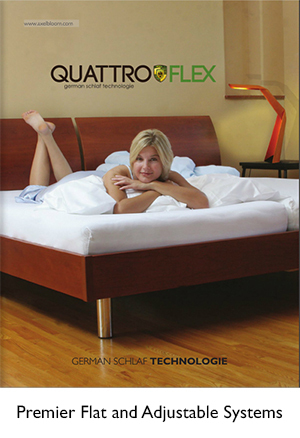 German Beds, Adjustable Bedding, European Bed frames. If you have a coil-spring mattress with a box spring, you can remove your mattress and place our suspension on top of a box spring. The mattress is then placed on top of the suspension. Usually the height of our bed suspension plus our mattress equals the height of a coil-spring mattress (9-14 inches). Therefore, by replacing an existing mattress with the Axel Bloom Bed Suspension and Mattress, the overall height will be the same. Note: Some adjustable systems may need more clearance room under the suspension. Please contact us before purchasing. If you wish to remove the coil-spring mattress and box-spring, you can replace them with our suspension in several ways. These three options may be used with flat and adjustable suspensions. Install the Feet and Cross Beams to the underside of the suspension. This option can be used by itself, such as a “Stand-Alone” suspension, or can be “Dropped-Into” an existing bed frame. Axel Bloom feet come in different heights. Please check that the height of the suspension from the floor is not exposed when placed within the existing bed frame. In addition, the feet will alter the overall height of the mattress. Please inform us how high you prefer the mattress top to be so that we can select the correct feet for your bed. Typically our bed base with our feet installed is 14-17 inches from the floor. If the mattress is 6-9 inches thick, then the overall height with the mattress would be 20-26 inches from the floor. Illustration of mattress and Suspension Dimensions. Illustration is a representation and is not approximate. If you wish to install our bed base without the feet, you may do so by supporting the sides of the suspension with existing ledges of your current frame, or you may add ledges to a frame. NOTE: Axel Bloom bed frames do not come with ledges. Only with Faceplates and L-clips. Install ledges. Then place the adjustable system to sit on top of the ledges. An alternative to ledges is the Axel Bloom Suspension Support Kit. This Kit may be attached to an existing bed frame. DO NOT USE the Kit in combination with ledges. Choose one or the other. 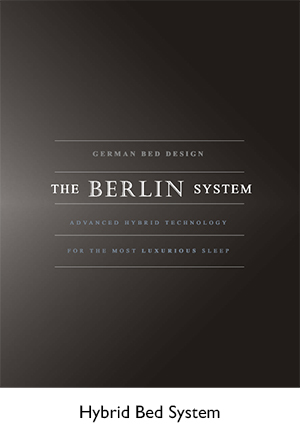 NOTE: All new Axel Bloom Bed Frame purchases include a Suspension Support Kit. The kit may also be purchased separately. The Suspension Support Kit can raise or lower the bed base up to 3 inches by moving the L-shaped support clips up or down. Four L-shaped Adjustable support clips with face plates. Screws are included. One center beam with two clips and face plates to anchor the beam to the head and foot section. Screws are included. One height-adjustable plastic support foot.